We are delighted to share our latest newsletter here. It provides a detailed history of the Estate, further information about what we do, and articles about activities on and around the Estate. We are particularly grateful to Sharon Graham for her efforts in putting this together. In advance of next week's AGM please find the latest newsletter here. In it you will find updates from our Chair (including a report on the lakes), a Finance report, and updates on new projects, CanonsTalk, sponsorship and security. There has been a lot of discussion following the AGM in April, notably around Resolution 5 which proposed that both benches at the Basin Lake be reinstated. Please find a full news update on this topic here. In advance of the forthcoming AGM, please find the March 2017 newsletter here here. Following the recent AGM, the latest newsletter contains details of the debate that took place, as well as updates on recent news of the Estate. The next AGM will be on Tuesday 22nd March 2016 at 8.00pm in the Music Hall at North London Collegiate School, and we very much hope you can join us there. It will be followed by a Question and Answer session with one of our local councillors, Ameet Jogia. Please remember you must be a Member to be able to attend. It has been a busy 12 months with the Association restructuring work continuing, desilting works and banking repairs to the Seven Acre Lake being carried out, and efforts being made to reduce the antisocial behaviour at the Basin Lake. This update provides detail of all these activities, an update on some of the other work carried out by the Committee on your behalf, and a reminder of the benefits of being a Member (notably our Member-only email distribution list). The next AGM will be on Wednesday 25th March 2015 at 8.15pm in the Drummond Room at North London Collegiate School, and we very much hope you can join us there. Please remember you must be a Member to be able to attend. The first report formally from Canons Park Estate Ltd, we start with an update of the work that has taken place in response to the storm damage. It has highlighted additional work that will need to be done in the months ahead and accordingly the annual subscription will need to be reviewed. We very much hope to be able to discuss this at the AGM on Wednesday 26th March 2014 at 8.15pm at North London Collegiate School. There is also an update on the restructuring, as well as a reminder of the main activities we are working at, on your behalf - trees, security, verges, and the website. The full update may be read here. This will hopefully be the last news update on behalf on Canons Park Estate, as we look to restructure in the New Year. The update provides the changes proposed and the roadmap to get there, and we hope as many people as possible will be able to attend the EGM on Monday 9th September at 8.00pm at St Lawrence's Church Hall, Whitchurch Lane. There is also an update on membership, security, culvert survey, trees, and social events. Please find the latest newsletter here and here. A grant from the Forestry Commission’s London Tree and Woodland Grant Scheme has helped the CPEL to restore and regenerate a major area on the far side of the historic Basin Lake in Canons Drive. The Canons Park Estate Association (CPEL), which owns and maintains the Lake – often referred to as the duck pond – successfully applied for a grant from the Commission as part of their Community Grant Scheme, which provides grants to projects that deliver community benefits to schools, open spaces and woodlands in Greater London. Although the area in question is not accessible to the general public because it also houses an electricity generator, it can clearly be seen from the hardstanding on the opposite bank – where visitors are welcome - as can the island in the centre of the lake, which hosts a willow tree and a number of nesting boxes for the wild fowl that live in or visit the lake during the breeding season. The funding enabled the Association to clear a huge amount of brambles, tree and shrub debris that lay on the woodland floor, stifling the growth of other vegetation and trees and obscuring an observation chamber in the outflow culvert that gives vital information on flood risks. In addition a great deal of remedial tree work was carried out, to ensure the survival and safety of the trees that line the boundary of the lake. The work took over a week and was carried out by experienced tree surgeons. 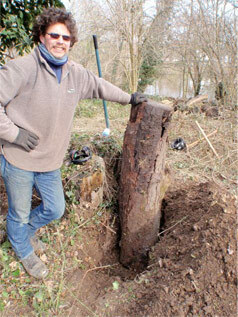 An expert from Whipsnade Zoo then came along to install bat boxes, to encourage nesting bats, and has used some of the logs from the tree work to install nesting areas for Stag Beetles, which are a globally threatened species. The timber provides a safe home for the beetles and will also attract other wildlife to the area. There are already a number of foxes living on the site as well as a wide variety of birds – both native and exotic, such ducks, Canada geese, moorhens, coots, and green ring-necked parakeets – which visit frequently or make their homes in the woodland. The work, which was completed in Spring 2010, is part of a major ongoing regeneration project being carried out by the CPEL. The works have already included the repair of eroded lake banking, tree pruning and hedge planting, and there will be further works in the autumn. CanonsTalk is a community network for members of the Canons Park Estate Association (CPEL). Information about local events and issues – from recommendations of a good plumber to appeals for a babysitter can be shared amongst other members of the Estate, helping them all to keep up-to-date and connected. If you are a member and wish to join the network, please contact Anuta Rosenfelder via enquiries@canonsparkestate.com and she will contact you to explain how the system works. Neighbourhood Champions are taking part in a new initiative created by Harrow Council to give all residents in the borough better access to council departments via road representatives who have exclusive contact numbers and email addresses in order to report problems and track the progress of the report. If there is a problem in your road – from fly tipping and graffiti to pot holes or continual anti-social behaviour, you can ask your road representative to report it to the council for you. To find out who your road representative is, please contact Sharon Graham via enquiries@canonsparkestate.com. At present, not all roads on the Estate have a Neighbourhood Champion, so if you want to volunteer, please contact Harrow Council direct.